The link in the tweet is dead now (as I’ll explain later), but essentially it’s from a startup whose business idea is to ‘trade’ (not sell, they repeatedly assure) the time of other people. The idea is that you bid on ten minutes of time with someone you want to speak to, for any purpose you like. The tweet AllThis sent, mentioning me. I had never signed up for the service, nor even heard of it before, yet they were implying that I’d agreed to give ten minutes of my time to whomever successfully traded for it. 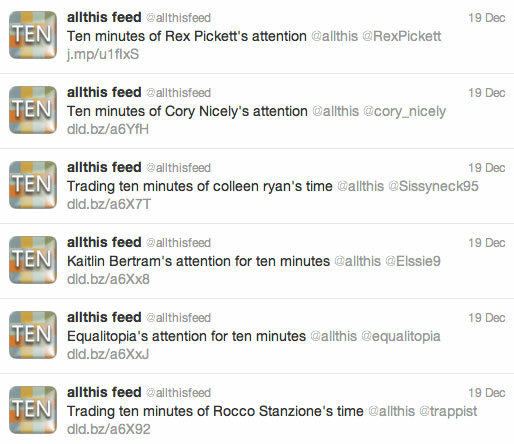 A very small selection of AllThis' tweets. The list included every type of Twitter user, including celebrity accounts, and all the links I clicked showed me pages for these people, with the small and subtle disclaimer that the person (like myself) was “not a member yet”. The person who “held” my particular fictional ten minutes also “held” those for John Gruber and others. This is not only dishonest, but also incredibly offensive to both those bidding on time and those whose time is being traded. There was understandable uproar about it, notably including Joel Housman’s post (which you should read). Then, VentureBeat covered it, and it’s since been linked from various other sites including The Loop. All of this negative coverage prompted AllThis to delete all of the pages they’d set up (they claim that it was in fact their users who initiated those pages by choosing people they’d like to have ten minutes of time with, but that’s an academic distinction - their service allowed it), and to post a “response to the recent controversy”. They allowed pages to be created which directly implied that people had consented to their time being traded. They publicised those pages on Twitter, mentioning the relevant person’s username, further implying endorsement. Their responses to the ‘controversy’ have been characterised by wilfully wide-eyed, blinking confusion at how anyone could possibly be upset, and arguments based on semantics which aren’t germane to the central issue of deliberately misleading people. They created a horrible situation between those whose time was unknowingly being traded and those who genuinely thought they were arranging some time with that person. Here’s my take on it. This is a startup, that’s been praised by Mashable and that’s trying to attract users and eyeballs. I don’t think that this was a naive mistake. I think they did it deliberately, fully aware that there would be uproar, and similarly aware that the uproar would provide a temporary huge boost in traffic (they say as much in their statement to VentureBeat). Whether or not the basic idea of AllThis is valid or useful, here’s my advice: don’t use their service. They’re at best extremely naive about people’s views about their own privacy and reputation, and at worse they’re willing to deliberately mislead you regarding who uses or endorses their service. This is not a business you want to have any involvement with. Marco Arment, in reference to this post. GigaOM: Its time to punish terrible viral marketing. BoingBoing: Sorry, you can’t buy our time from shifty startup Allthis. The Rude Baguette, on AllThis’ poor public handling of the situation.